St Mary's marksman Mark Breheny took the man-of-the-match honours in today's Castlebar curtain raiser as his haul of a goal and six points steered Sligo into the fourth round of the qualifiers with a 1-13 to 1-11 victory over Clare. A five-point glut before the break had Clare motoring and taking in the break with a 0-8 to 0-6 buffer. The second half saw the roles reversed as Sligo, beaten twice by the Banner men last season, quickly levelled for a fourth time before racing clear to a 1-13 to 0-11 victory. Clare's cause was not helped by Ronan Slattery's sending-off midway through the second half. The wing back, only back from a month-long suspension, was dismissed for a second yellow card for his involvement in an off-the-ball incident. Clare had opened well with two points from Peter O'Dwyer and Rory Donnelly but a concerted spell of pressure from the Yeats' men soon yielded scores. Sligo led 0-5 to 0-3 by the quarter-hour, with Sean Davey, Patrick Naughton, John McPartland (0-2) and Breheny (free) all on target. Clare boss John Kennedy threw Michael O'Dwyer and Conor Whelan in off the bench on 20 minutes and the switches immediately paid dividends. O'Dwyer pointed from his first touch and although Breheny was allowed dink over a second free, consecutive points from Peter O'Dwyer, Enda Coughlan (f), Odran O'Dwyer and Donnelly (f) set up the Munster side's two-point interval buffer. 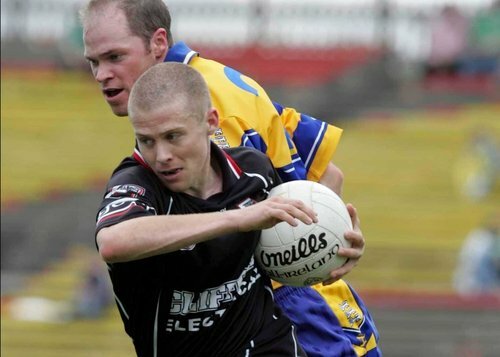 Stirred into action by manager Dom Corrigan, Sligo roared back into contention, levelling matters for a fourth time on the restart before earning a 0-10 to 0-8 lead. Two Breheny frees squared things up in front of a McHale Park attendance of 10,000, then the Daveys - Sean and Jonathan - raised white flags. Clare had little to offer in return, and indeed a trio of Donnelly frees marked their only scores of the second half. Slattery's dismissal saw them on the back foot and Sligo mopped up at will, going 0-12 to 0-10 in front before Breheny goaled brilliantly on the hour, after Brian Curran, Dessie Sloyan and Sean Davey had combined to carve open the chance. That strike effectively decided the issue and McPartland gleefully ended Sligo's third qualifier win of the summer with his third point from play deep in injury-time. Sligo: P Greene; P Naughton (0-1), J Martyn, B Philips; P Doohan, B Egan, J Davey (0-1); S Davey (0-2 (0-1f)), N McGuire; J McPartland (0-3), M Breheny (1-6 (0-5f)), D McGarty; D McTernan, D Sloyan, G McGowan. Clare: D O'Brien; P Gallagher, D Kelly, G Tubridy; A Clohessy, R Slattery, M O'Connell; G Quinlan, P O'Dwyer (0-2); M O'Shea, E Coughlan (0-1 (0-1f)), D Russell; R Donnelly (0-6 (0-6f)), S Hickey, O O'Dwyer (0-1 (0-1f)).